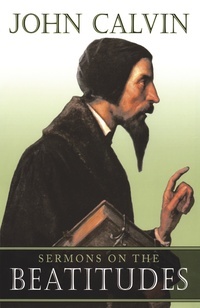 Among the many activities which claimed Calvin’s attention during his long ministry in Geneva (1536-1538; 1541-1564), preaching was the most public and perhaps the most influential. Public because, for many years, twice on Sundays and daily in alternate weeks, the Reformer stood before a congregation of townsfolk, refugees and visitors to teach, warn, appeal, counsel, admonish, and encourage. Influential because, vital as the Institutes, commentaries and treatises were to the defense and propagation of Christian doctrine, it was the Word preached and applied from the pulpit which above all fashioned Geneva’s evangelical culture and made it the nerve-centre of Reformed Protestantism. This volume presents readers with a short series of sermons on the Beatitudes, translated for the first time into English by Robert White. They comprise Calvin’s exposition of Matthew 5:1-12, Mark 3:13-19 and Luke 6:12-26. Five sermons were preached on the Beatitudes in the course of an extended treatment of the Synoptic Gospels. Begun in July 1559, this series had still not been completed by February 1564, when ill health forced the Reformer’s retirement from the pulpit. His absence was to be permanent: he died three months later, in May 1564. The late date of these sermons, therefore, marks them out as a definitive example of the Reformer’s mature pulpit style. They represent his very last effort to elucidate a New Testament text in the context of regular public worship. Translated into a modern idiom, this book will transport the reader back into sixteenth-century Geneva, where he can hear the Reformer preach on issues of perennial Christian concern.